FERDINAND HOFMANN was born in Vienna in 1756, the same year Mozart was born in nearby Salzburg. In 1784, at the age of 28, Hofmann established a piano-building workshop that came to employ eight workmen. The workshop, which operated for close to forty years, was reported to have been able to produce instruments at the rate of one per week. Hofmann was a respected member of his community. In 1808 he served as chairman of the Municipal Organ & Piano Makers. In 1812 he was granted the title, “Imperial & Royal Court Chamber Instrument Maker”. 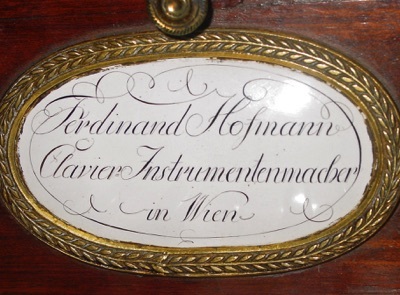 Hofmann closed his workshop about 1825. He died in 1829 at the age of 73, leaving his wealth to charity. His death followed closely the passing of Beethoven (in 1827) and Schubert (in 1828). It may interest the modern pianist to note that there is a direct line from Hofmann to Bösendorfer. Ignatz Bösendorfer, founder of the illustrious piano company, was an apprentice of Joseph Brodmann who was, himself, an apprentice of Ferdinand Hofmann. Piano in private collection, Spain. Photo used with permission.